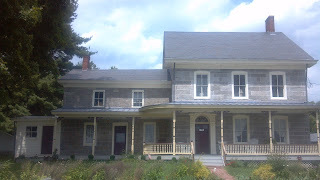 Several years ago, my work took me to Lower Alloways Creek from time to time, bringing me past the Colonial-era Hancock House. What I was doing in a remote part of Salem County is a story for another day. The important thing to note is that every time I went past, the house was closed, leaving me with unsatisfied curiosity. 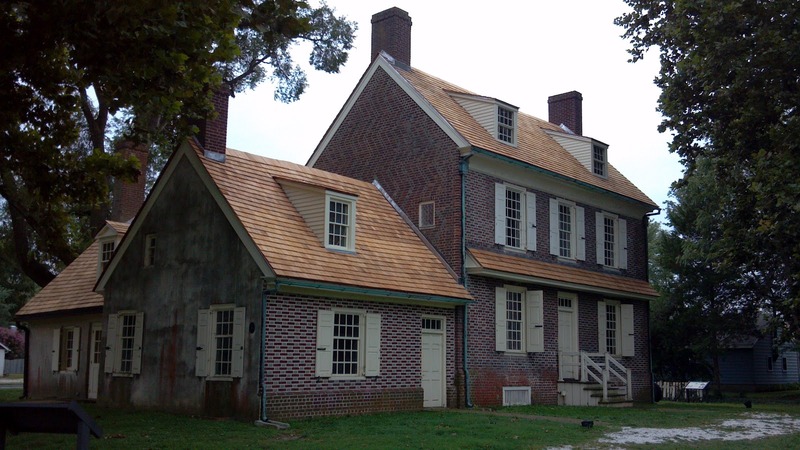 Hancock House is more than a nearly-300-year-old house whose bricks are laid in interesting patterns. It was the site of a March 1778 massacre. When Ivan brought up the possibility of spending a day at the Delaware bayshore last weekend, I suggested that we make a visit to the Hancock. Maybe it would even be open this time. Before we get into our trip, let's talk about the massacre. Just a few days earlier, the Americans had taken the surrounding area after the battle of Quinton Bridge, about 90 Continentals were quartered at the Hancock House. The home's owner, William Hancock, was a judge and a Tory, and he'd left the area once the American forces achieved dominance. However, he returned on March 20 and was quickly taken captive. All were asleep when a raiding party of 200 British soldiers attacked the house early the next morning. Many of the Americans were bayonetted in their sleep; others pled in vain to be taken prisoner. A precious few were able to escape, but ironically, Hancock himself was murdered by the loyalists with whom he agreed. The house is now owned by the State of New Jersey and run by local volunteers. I'd actually stumbled upon the house being open on a March day many years ago, and found the guides to be very friendly and knowledgeable. In fact, before I left that day, they implored me to come back few weeks later for a reenactment. "You'll really like the massacre," they told me. "It's a lot of fun!" We weren't as lucky with the latest visit, though I'd checked the website in advance for operating hours. A sign outside the house said the volunteer staff was at a street fair in Salem City, so no one was around to show us the interior. Even if you have the same luck we did, however, there's lots to see around the property. The site's interpreters probably realized that a fair number of visitors would happen by when no-one was there to tell the story, so they developed really good signage. The house exterior is the logical first thing to check out, but it's not exactly obvious since it's on the side not facing a street. 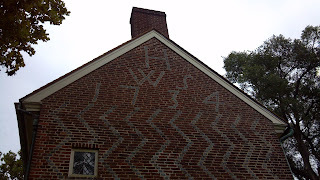 The patterned end brickwork contains both a zigzag pattern and the initials of the house's owners, William and Sarah Hancock, along with 1734, the year it was built. Overall, the architecture reflects the English/Quaker influence of the European settlers in that part of New Jersey. Salem County is second to only Burlington County in the country when it comes to the number of surviving brick houses with pattern designs. Next, there's a Swedish plank cabin on the property. This building itself was built in 1931 by the Civil Works Administration with 400 year old cedar mined from property in Salem. All of the craftsmanship is authentic to the 1700s, meaning it would look very familiar to the Swedes who settled in the area during Colonial times. An informative wayside offers all the information you'd probably want to know about the cabin. We also took a few minutes to check out the creek that meanders in front of the house. While there was no real wildlife to be seen, I don't doubt that the occasional muskrat makes its way through, along with various waterfowl. Yet another marker explains that PSE&G has been doing mitigation work to encourage the growth of water life in consideration for the operation of its nuclear plant a few miles away. Satisfied we'd learned as much about Hancock House as we could expect that day, we set course for our next destination. We'd learned about a massacre that didn't occur in Boston... how about a tea party that didn't happen in Boston, either? Off we went, traversing the back roads to Greenwich. Discovery Channel has Shark Week. Hidden New Jersey had Heron Week. Okay, it doesn't have the same menacing bite or blood-curdling suspense, and we didn't need to protect ourselves with a cage, but our bird week had the element of surprise and even a fun new dance step. the Meadowlands for a couple of weeks. Last Wednesday, I had a three-heron day at Echo Lake Park in Mountainside. The lower lake segment yielded a not-unexpected great blue heron along with a curfew-busting black-crowned night heron. 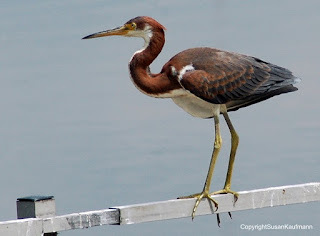 The nice surprise for me there was the presence of not one, but two green herons. While they're not tremendously rare, they're not exactly an everyday occurrence, and I was glad to have found and identified them on my own. Union County parks in August. 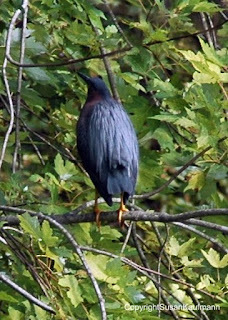 The next day I returned to Echo Lake with my camera, hoping to get a shot of the green heron, but he'd already moved on. Just as well, as I located one (maybe even the same guy) at adjacent Lenape Park in Cranford. A subsequent trip to Surprise Lake in Watchung Reservation yielded yet another greenie, not far from another great blue. Later that afternoon, a check of the American Bird Association bulletin boards revealed big news: a reddish egret was spotted at one of our regular birding destinations, Forsythe NWR (a.k.a. Brig). This was significant. I'd never seen one, and the range map in the Sibley guide showed it as a rare visitor to the Eastern Seaboard. Just as important, the guide described the bird as "very active, chasing fish on foot, running, jumping and spinning." This I had to see: the Bird Minister of Silly Walks. Check out this video for a sample, and tell me you wouldn't want to check it out, too. There's something very appealing about watching a bird that looks like a drunken frat boy hunting for his lost keys. Ivan and I decided that waiting for the weekend was not an option. If reports in the morning said that the bird was still at the refuge, we were making the trip to see it. All egrets, of course, are herons, so a chase for the reddish egret would fit perfectly into our theme week. Friday morning dawned, bringing with it news of the bird still in its reported area at Brig. After getting some non-birding activities out of the way, we hopped on the Parkway, hoping the shore traffic hadn't started yet. We ran into some frustrating construction delays but told each other that if fate deemed the bird would leave before we got to him, we'd accept it. Once we got to the refuge, we blew off the usual first stops and went directly to the eight-mile loop road through the marsh. Thursday's reports had the bird at the dogleg turn about three-quarters down the road, but a crowd of cars and birders were clustered about a mile or two into the drive. If this wasn't the egret, it was definitely something worth seeing. Ivan pulled up to a couple of the gathered birders and rolled down the window to ask if it was the reddish egret. Yup. "I thought it was at the dogleg." The other birder shrugged. "It has wings." Our quarry was roosted in a distant cedar tree, along with a couple of snowy egrets. Apparently he'd already eaten, because he seemed more interested in preening than in jumping down and doing the runaround dance. Or perhaps we'd just timed it badly and had to wait for the next show. In any case, his staying put allowed us to get a good view through the scope, enough of a study to feel that we could add the reddish egret to our New Jersey birding lists. And besides, though the bird didn't seem to want lunch, we humans were famished. We'd head over to JD's for a burger and return to see what else Brig had to offer us that day. Our hunger eliminated, we returned to the refuge, this time making our usual stops before embarking on the loop road. A stop near the gull pond produced a view of easily a dozen great egrets perched in a tree, along with assorted others wading about. In the time since we'd left, however, the tide had rolled in, displacing many of the shorebirds that had been walking around the mudflats on our earlier visit. Maybe this wouldn't be such a productive visit, after all. A new set of birders were perched and focused at the same spot in the road as we'd been with the earlier crowd, and for good reason. Perhaps encouraged by a higher water level, the reddish egret had come down from his perch to forage for fish. We stopped again, pulled out the viewing scope and were rewarded with the sight of him pacing around the shallows. Apparently a juvenile, he didn't seem to have the silly walk down pat, but he was entertaining to watch, nonetheless. Seeing that performance, I was satisfied to have gotten a good view of a creature I might never be in the presence of again, at least not in the Garden State. That would have been a great ending to Heron Week, but our luck continued the following day when we visited Salem County. Driving through the countryside enroute to Hancock's Bridge, we passed the inevitable cattle and... the accompanying cattle egrets. Ten of them were patrolling the pasture, some close to the cattle and others a little on their own. Not as improbable to New Jersey as the reddish egret, it was still a nice find for us. Heron Week aside, we've been very fortunate to see some rare and wonderful avian visitors to New Jersey over the past year. Whether it's due to global warming or just an odd coincidence for them to find their way here, I'm grateful that places exist for them to rest, find food and seek refuge. Who knows what's in store for next year's Heron Week? Take a good look at a map of New Jersey's towns and cities, and you'll see the names of once mighty companies that built them or were the dominant employer. Somerset County's Manville was once home to Johns Manville's massive asbestos processing operation. 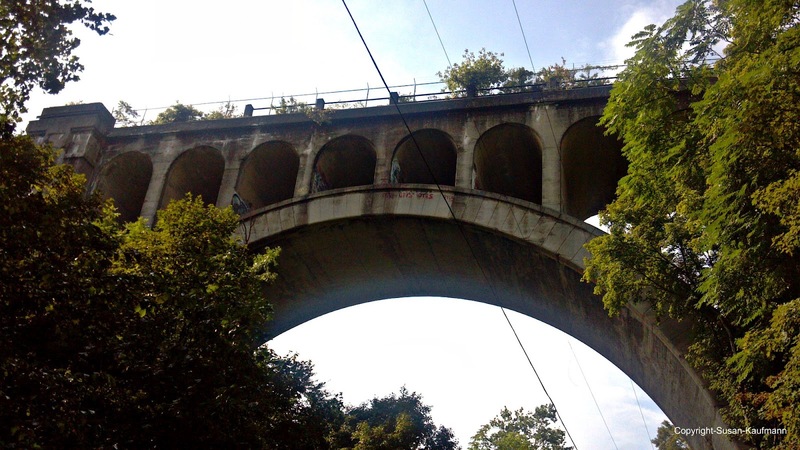 Roebling, in Burlington County, was built to house employees of John A. Roebling's Sons and Company, manufacturers of the steel rope that still supports mighty bridges across America. Helmetta was built around George Helme's snuff factory in Middlesex County. And then there's Aeolia, in Union County. Aeolia? Okay, I fudged that one. You might recognize it as Garwood, smack between Cranford and Westfield. The only indication left of the little-known alternative name is the header atop the entrance to the crenelated red brick building on North Avenue. Workers in this century-old building once made pipe organs, player pianos and perforated music rolls for the Aeolian Company, the leader in its industry. These days, player pianos are a rare novelty, but apparently they were huge in the early days of the 20th century. A 1899 New York Times article stated that Aeolian became the sole player piano company in the United States after absorbing two of its competitors. The company consolidated operations at a new plant in Garwood, built along the Jersey Central Railroad line. As a condition of moving to New Jersey, the article said, the company had the option of naming the town Aeolia. It's an interesting statement, given that Garwood wasn't even an incorporated town at that point. Rather, it was a real estate development the railroad had carved from the towns of Westfield and Cranford. Named for Samuel Garwood, president of the development company, the community was largely industrial, with Hall Signal Company and Hercules Tube Works being the major employers before Aeolian came to town. Garwood was a tight-knit, working class community, but its uncertain status caused a fair bit of confusion. 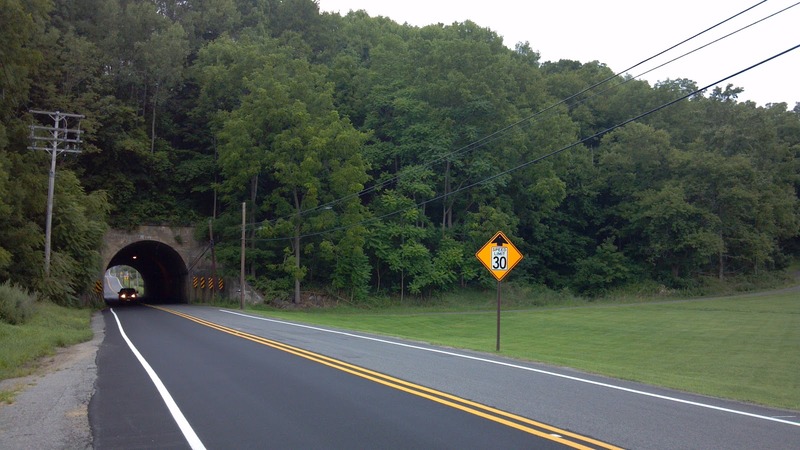 According to the town's website, Westfield and Cranford often disagreed over which town was responsible for providing essential services within the less than mile-square enclave. Which school system would Garwood students attend? Who was responsible for paving Center Street through the business district? The Aeolian Company settled the matter of fire protection by forming its own squad and buying equipment. Most of the issues were resolved when the roughly 400 Garwood citizens achieved independence from their squabbling neighbor towns in 1903. It's an interesting thing to consider these days, as consolidation of municipal services is frequently raised as a cost-cutting alternative to the status quo. For the residents of the newly incorporated Garwood, however, it made a huge difference in solidifying what they could expect from their local government. Over a hundred years later, much of Garwood's industry has left, and many of the old factory buildings have been torn down or repurposed as retail space. The office section of the Aeolian building still looks neat and manicured, though the factory portions could use some help. For a while, a paperboard recycler operated there, but in recent years the place has looked unused. Whatever becomes of the property, I hope they keep the brick building and the Aeolian sign above the main entrance. Our visit to White Lake built up a thirst, so we found ourselves wandering in search of liquid refreshment. We found it at the general store in Stillwater. directly in front of it. If you've done any wandering through the less built-up areas of the state, you've probably run into a historic general store building or two. I say 'historic' because many of them don't serve the 'general' purpose anymore. Instead of selling various groceries and housing the community post office, they've been converted into gourmet sandwich shops or coffee houses. There's nothing patently wrong with that -- repurposing buildings is often the best way to preserve them -- but they lack a certain authenticity. They often sell fair-trade coffee by the pound instead of penny nails, and if you need toilet paper or soap you'd better be prepared to drive a distance to a big-box store. The minute we pulled up to the Stillwater General Store, it was clear which category it falls into. An out-of-service Texaco Fire Chief gas pump stood in front of the porch, paired with one of those vintage advertising signs. Both came by their weathered appearance honestly, as did the screen door that had clearly welcomed generations of local residents. Once inside, we passed a wall of post office boxes on the way to the beverage cooler. To be honest, I was so focused on getting something to drink that I didn't study the groceries on the shelves, but it wouldn't be an exaggeration to say that they probably focus on the bare necessities someone might need when a trip to a distant supermarket was out of the question. Oh, and when we made our purchase, the proprietor said something about pie. I'm still regretting passing that up. I mean, Sussex County pie must be really good. Our thirst issue resolved, we noticed that the general store wasn't the only interesting building in town. A short walk brought us to the home of Casper Shafer, the German immigrant who'd settled the area in the early 1740s. 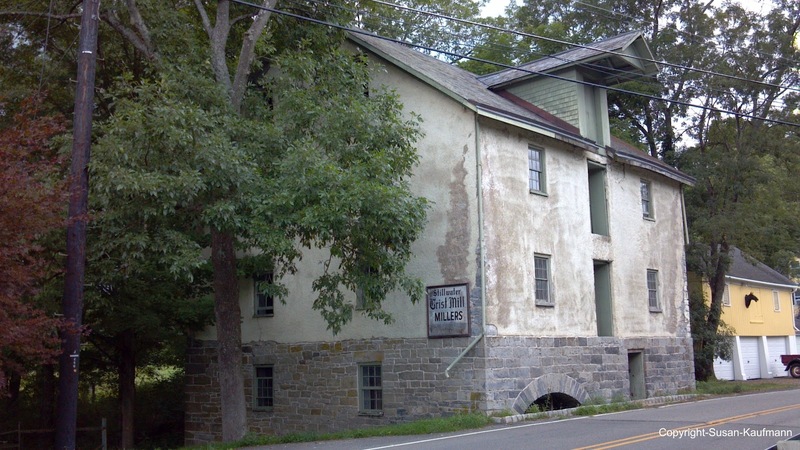 While the Vass family was growing grain in Hardwick, Shafer ran a successful grist mill that was paired with a sawmill just before the Revolution. In addition to counting on the nearby Paulins Kill to power his mills, he used the waterway as means to get his product to the Delaware and eventually to customers as far away as Philadelphia. Shafer's wooden mill was destroyed by a fire in 1844, but its replacement still stands nearby, looking as if it could be transplanted to an old village in the Alps. In fact, it looks a little too good, as if it shut down just a few years ago. Actually, in the continuum of milling in New Jersey, that's the case. Its continuous operation ended in 1954, but new owners reopened it in the early 1970s, running it as a milling business during the week and an educational establishment on the weekends. It's not clear when the Stillwater shut down for good, but when it did, it was the last of New Jersey's operating grist mills. The industry had fallen victim to development, as more grain farms were sold and converted to residential communities. Somehow, Stillwater seems to have avoided overdevelopment, or at least the area around Main Street has. 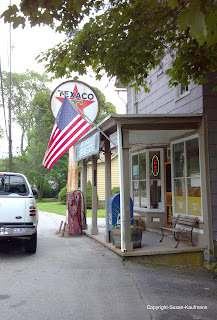 On our Sunday visit it was quiet, except for the steady flow of visitors to the general store. There were an assortment of other buildings we didn't check out... the church on the hill and the historical society, to name two. Maybe another time, when we'll be sure to stop for the pie. The appearance of a misplaced brown booby brought Ivan to White Lake in Hardwick a few weeks ago, and when he told me about the location, I knew I had to check it out, too. By the time we went together, the booby had already moved on, but the trip was definitely still worth it. Just a few hundred feet off County Road 521 (Stillwater Road), the spring-fed lake is fronted by a lovely field of wildflowers that likely yield a nice assortment of butterflies. Parking is easy, as is the walk to the lake's edge, offering unusually quick access to a true hidden gem. Several people were lifting kayaks out of the water just as we arrived; it looked like a nice, calm place to do some leisurely rowing. If I were artistically gifted, I'd be inclined to bring out an easel and paint the landscape. Bob Ross, where are you and the happy little trees? Managed by Warren County and the State Division of Fish and Wildlife, the White Lake Natural Resource Area contains several habitats, including a hemlock forest and a boggy fen at one edge of the water. However, the property hasn't always been allowed to exist as a pastoral area. The most visible sign of that is the stone farmhouse and wooden barn just across the road; the other indications of man's interference have apparently been overtaken and obscured by nature. The Vass farmstead dates to the earliest days of the 19th century, home and workplace to German immigrant John Vass and his family. They expanded the farm through acquisition over the years, growing a variety of grains and apples while also raising livestock for sale. Living at first in a log cabin, the success of the farm enabled them to build the sizable stone house overlooking the pond. After John's death in the 1850s, son Isaac took over the family business, eventually selling some of the land on the far side of the lake to the Knickerbocker Ice Company of Pennsylvania. Ice, however, was only part of the reason the company sought the property. 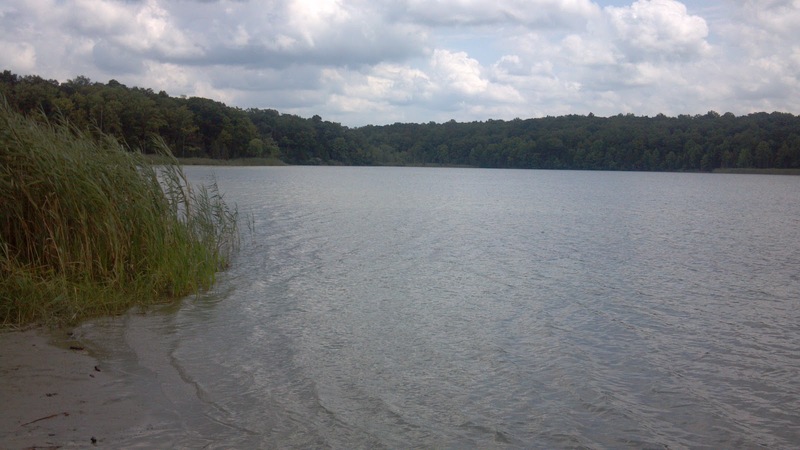 During the warmer months, it mined the water's bottom for the shells which gave White Lake its name. The mineral content of the shells was used first as a marl fertilizer, and then as an essential component in the production of cement. 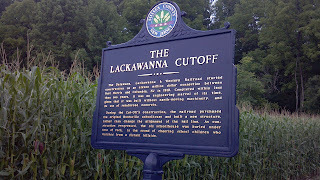 When the region's ice industry was essentially overtaken by more efficient competitors to the west, Knickerbocker withdrew from the lake, replaced by other companies with greater interest in marl and cement production. Their business was short-lived, marked by the scandal of a partner's thievery, and the lake was apparently never mined again. Today, the only indication of the Knickerbocker company's activity at White Lake is a large stone structure which was once the largest building in the area. Used as a warehouse for ice or marl, depending on the season, it's now barely noticeable from the farmstead side of the lake. We didn't even see it while we were there, though I suppose it might be more visible after the summer foliage fades away in the fall and winter. More important to us, the sale gave us a chance to get an overhead view into the not-yet restored part of the barn that apparently housed dairy stock. The echoing moos are but a distant memory, but it seems that the property is reverting to a state that John Vass and his family would recognize quite well. Fresh off our Clara Barton discovery, Ivan and I drove to downtown Bordentown to see what other treasures were there for the finding. What we found was a quaint downtown, more of a 19th century feel than Burlington or Mount Holly, but still a throwback. Bank buildings were large and stately, the streets were wide and welcoming, and the architecture is Colonial with a mix of Classical and European influence. Some of the yards were fenced off with very cool wrought iron. Oh, and there were some cute shops and eating places, too. It's a nice place to stroll and browse on a summer afternoon. Important to us, sites of note were clearly marked. Bordentown is clearly proud of its heritage, both as a hub of transportation and as home to a cast of characters who might be considered rabblerousers of the Revolution. Starting in colonial times, the town's location made it a key spot for travelers between New York and Philadelphia, so it was a natural base of operations for revolutionary notables. Thomas Paine, the noted patriot and author of Common Sense, lived in Bordentown when he wasn't in France. You may recall that we first ran into his New Jersey exploits at New Bridge Landing, where Washington's 1776 retreat inspired Paine's classic, The American Crisis. Lawyer and artist Francis Hopkinson stayed in town after marrying the daughter of the man for whom Bordentown is named. Hopkinson not only signed the Declaration of Independence, but was a talented satirist and is credited with designing the New Jersey state seal. He's definitely a subject for a future Hidden New Jersey post, but for now we'll say that his poems and jingles inspired patriots both to fight for independence and to have a good laugh at British military. The tracks of New Jersey's first railroad, the Camden and Amboy run on the bed of a sub-surface cut through downtown. Just a mile away, the state's first steam locomotive, the John Bull, was built and tested in 1831. The Delaware and Raritan Canal's western end is at the base of a steep embankment just outside the business district. The home of Patience Wright, who was America's first sculptress of note, well, when she wasn't spying for the colonists in London. We also found a bit of fun in the shops around town. Crammed with all kinds of pop culture musts, Randy's Man Cave lacks for floor space to walk on, but more than makes up for it with Beavis and Butthead bobbleheads, loud music and Quisp cereal (really!). There was a bit too much Phillies memorabilia, but given the location, I guess that can be forgiven. Apparently the entrance to Bonaparte's estate. We heeded the sign's direction. The marquee explorer's site in Bordentown, of course, is Point Breeze, home of the exiled Joseph Bonaparte, King of Spain and Naples. Much of the site is overgrown and foreboding, with the remainder taken over by the Divine Word Seminary, so we left it unexplored, regrettably. Given the dense vegetation and the connection to noted ornithologist Charles Bonaparte, it would have been a kick to do some birding there. Having checked out the wonders of Mount Holly and done some reconnaissance on potential nearby birding sites, we decided that maybe it was time to head back home. That, however, was a short-lived plan. We'd just made it onto the Turnpike from the Pennsy Pike extension when we ran into a massive traffic jam. Rather than sitting there, we decided to exit at Interchange 7 and take our chances with Route 206. "I have a feeling we'll run into something really good," Ivan said, confidently. If past experience could be our guide, he'd be completely correct. Exit 7, of course, serves Bordentown, a place I'd long wanted to check out. The closest I'd gotten was finding out the Bonaparte connection... but never knew quite why the town would hold any interest for an exiled 'royal' family. Per Ivan's prediction, it didn't take long for us to find something interesting. As we drove down Crosswicks Street, we came upon a small building with one of those glorious blue historic markers. "Clara Barton School." Many don't know this, but before she became known as a leading health advocate and founded the American Red Cross, Barton was a schoolteacher. She was a Massachusetts native but came to teach in Bordentown after a visit to a friend in Hightstown. At the time, the custom was for teachers to bill students at the end of each term, a practice she sought to change in favor of a free public school supported by funding from the town. In her estimation, far too many children weren't getting an education because they couldn't afford private school tuition. Her popularity with students and parents helped to push the idea forward, and in 1852 the town allowed her to start her new school in a one-room building that predated the Revolution. As more and more children learned about the availability of free education, the school quickly swelled to a student body of 600. More teachers and more buildings were pressed into service to manage the demand. Unfortunately, it appears that Barton's success planted the seeds of her undoing in Bordentown. According to the Bordentown Historical Society website, a lengthy bout with laryngitis caused her to miss a few months of school, and in that time, local officials replaced her with a male principal at a salary reported to be twice what she was being paid. She was also deemed to be his assistant, a position she found distasteful. She resigned her position and moved to Washington D.C. for higher-paid employment. Barton made an indelible impact on Bordentown and New Jersey in just over two years. She'd founded one of the first free schools in the state at a time when free education, while provided by statute, was rarely provided to any but the indigent. Children all over the state joined forces in the early 1920s to honor her work by restoring the one-room schoolhouse, and today it stands as a picturesque reminder of the dynamic woman who brought knowledge to those who might not ordinarily have had the chance to study. Our stroll through Mount Holly brought us to a classic part of virtually any colonial town: the inn. The Mill Street Hotel and Tavern looked the part, even without the sign hanging on the porch, stating the founding date as 1723. The WPA Guide to New Jersey describes the place as “the last remnant of the Three Tun Tavern,” with “original brick walls, revealed in places by a crumbling coat of stucco.” During Colonial times, inns were classified by size, with the ‘tun,’ or hogshead, used as a measure of the amount of liquor there. The Guide goes on to describe a covered cobblestone drive where stagecoaches would stop before heading to the carriage yard around back. Both the stucco and the drive are gone, the former leaving a brickface and the latter being replaced by a garage door and transom windows. While it appears that the hotel may have evolved into a rooming house, a neon Coors Light sign indicates that the bar is still in business. It was a bit too early in the day for us to check on that personally. Initial research on the place doesn’t reveal much else, except conjecture that the British Court of Admiralty met there in the last year of the Revolution. Mount Holly was occupied from time to time during the war, and while I can’t find any information on specific judicial action there, patriots generally found Court actions objectionable. Admiralty judges were paid based on the fines they levied, so their decisions could be, well, somewhat influenced by factors other than the law. One last thing about the Mill Street Hotel and Tavern: there was something about it that drew the focused attention of some interesting raptors. In my experience, it’s fairly unusual to see a pair of black vultures peering into a chimney, but that’s what we saw. Perhaps an errant squirrel or raccoon had made its way up the roof and into the flue, expiring there when it couldn’t get out. We couldn’t quite tell, and the vultures weren’t saying a word. Maybe they're the returned spirits of the Admiralty judges? Walking around a town like Mount Holly makes you yearn for the days when public buildings were designed for both visual appeal and functionality. The Relief Fire Company's 1892 building on Pine Street is a case in point, a solid stone structure with a highly-decorative Victorian-style tower topped by a horn-shaped weather vane. Though the truck bay doors are obviously replacements, it's not hard to imagine that the original doors might have been of handsome wood with metal trim. As impressive as the firehouse is, though, it's almost incidental to what makes the Mount Holly fire fighting story remarkable. THAT story is in a small red-trimmed yellow shed on the other side of the fire department driveway. It doesn't look like much, but it's the origin of the country's oldest, continually-operating volunteer fire company, founded in 1752, when the town was still known as Bridgetown. Relief's original name was the Britannia Fire Company of Bridgetown, in recognition of its members' allegiance as British subjects. According to the Mount Holly fire website, each member was required to hang a leather bucket outside his house, and keep it filled with water and ready for use in protecting his neighbors' homes and property from fire. The town's first water pumper truck was purchased in 1755, though the firehouse to store it wan't built until 1798. By that time, the company had changed its name to the Mount Holly Fire Company, considering "Brittania" to be both unpatriotic and anachronistic. The small firehouse was sold in 1837 and became a toolshed for the local St. Andrew's Graveyard before being returned to the fire company and placed on its current Pine Street site. Eventually, the fire company's name was changed yet again, to Relief, and the current firehouse was built in 1892. Visitors today can stop by the old firehouse and an adjacent shed, which houses a vintage pumper truck and other memorabilia. We weren't able to go inside, but a large window allowed us to see the contents of the museum from the sidewalk. The building isn't big or tall enough to accommodate the sliding pole or dalmatians you imagine to be part and parcel of every firehouse, but it offers an interesting view into what firefighting was like back in the day.